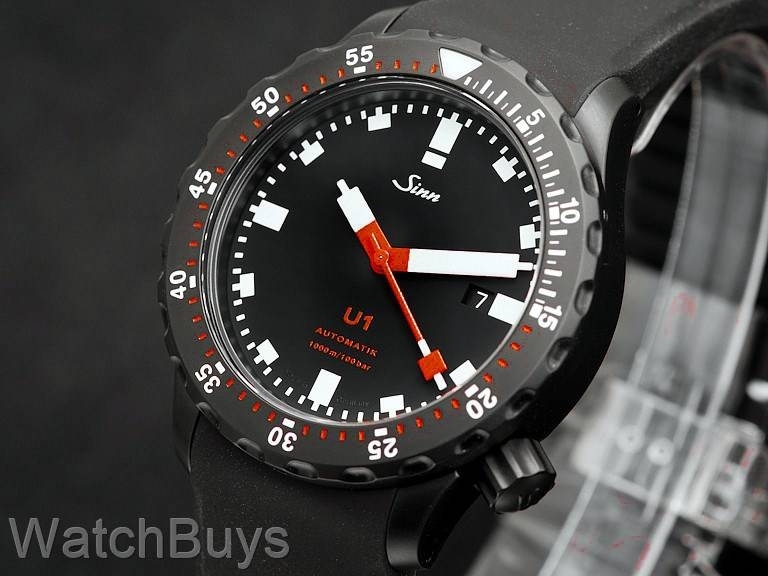 We cannot count the number of times we've been asked this question - when will Sinn produce a fully Tegimented, all black version of the standard Sinn U1? The new Sinn U1 S on silicone rubber strap features the same great case design made in-house from German submarine steel at Sinn's case making facility in Glashutte, Germany. Once the case is complete, the Tegimenting process begins, and when we say "fully Tegimented" we mean what we say - case, crown, bezel, case back, locking strap clasp and even the anti-reflective coating. The combination of the submarine steel and fully Tegimented PVD black case create superior scratch and corrosion resistance. The international testing lab of Germanischen Lloyd has tested the Sinn U1 S, and determined that the watch can be certified as water resistant to 1,000 meters. This same firm tests submarines for their ability to withstand the effects of underwater use. Other features include sapphire crystal with anti-reflective coating and screw down crown. This watch is fitted with a black Sinn silicone rubber strap with black PVD Tegimented locking buckle. Verified Owner Comments: WOW! I just received this watch today, and had my doubts about the PVD finish. I have seen the darkness and I am a believer! The quality of the timepiece easily rivals the Tudor Pelagos I bought this past May. And the minimalism of the Black dial is breathtaking. 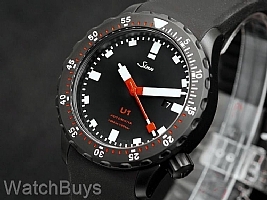 I had a Sinn U2 that I sold soon after I purchased the Pelagos, and honestly as nice as the U2 was, the U1 is the watch to beat IMO. Verified Owner Comments: It's a beautiful watch. The design is unique. Love the way the second hand seems to float over the dial. The rotating bezel doesn't quite line up at 12:00 and is a bit sloppy. The clasp on the rubber band is much too long and causes the watch not to sit right on the wrist. I put a NATO on the 2nd day. For more than $2000 it should be right.